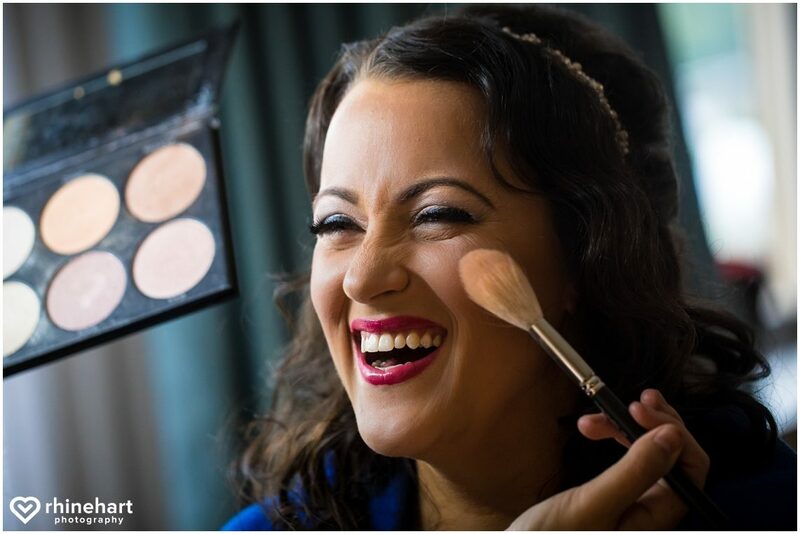 Stephanie is such a character– she is intelligent, witty, fun-loving and a total planner. I liked her from the moment that she reached out to me. Her initial email made me laugh out loud! We had our initial consultation before Ryan had popped the question and before she had chosen a venue! After the meeting, I wrote in my notes, “I like them a lot– her personality needs to be captured– they have such an amazing story!” He did propose, and I captured part of their amazing love story here as we went back to the cabin where they met and photographed them skiing down a double black diamond among other things, it was epic! As for capturing that fun-loving, energetic personality, I found the perfect opportunity when I saw the gift she bought her bridesmaids, flannel hooded onesies with names on the front and titles on the back. 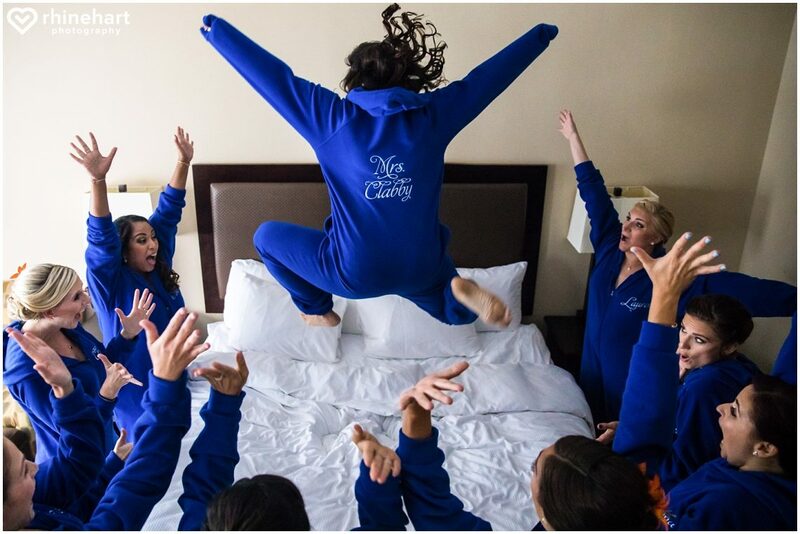 I asked her how she felt about jumping on the bed– she was game (of-course)… haha her bridesmaids’ expressions!!! Steph and Ryan exchanged hand-written notes in the morning and read them to themselves, it was an intimate moment. I wanted the photograph to feel soft and private, yet crisp and clear– high contrast. And here he is again pulling off beautiful visual symmetry and the rule of thirds, zen-master Kris :). You look great, guys! On to Ryan’s favorite part of the day– the first look, when he saw Steph for the first time on the wedding day. First Looks have really become a staple of modern wedding traditions. Having a “first look” allows a couple to really take their time and soak in the moment while also helping the flow of the day and allowing the couple to enjoy the cocktail hour with their guests. While I love capturing more creative images, I make sure to take a few more traditional photographs as well. As soon as everyone entered the reception, the Hava Nagila began to play and Steph and Ryan were lifted up on chairs– Ryan looks a little nervous, no? But he was enjoying himself in no time! Ryan had tears in his eyes as he watched Stephanie dancing with her father… it was a very special moment for everyone. One of the most touching moments of the evening was Stephanie’s father’s speech. The lighting, created by FNA events was pretty incredible and really set the tone for the evening. In this shot I tried to capture the elegant setting as well as the packed dance floor. I set out to try and capture the high-octane experience that was the dance floor– this photo almost makes you feel tipsy, right? Kris and I took some time to set up interesting lighting while Ryan and Steph were enjoying the party. Steph and Ryan, it was such a pleasure getting to know you two and I will never forget hour incredible adventure at Hunter Mountain. Thank you for choosing Kris and I to capture your precious memories. You two are amazing and I can’t wait to see what the future has in store for you! If you want to see more of Ryan and Steph, check out their Hunter Mountain engagement session here.